Quick lesson on curling scoring. 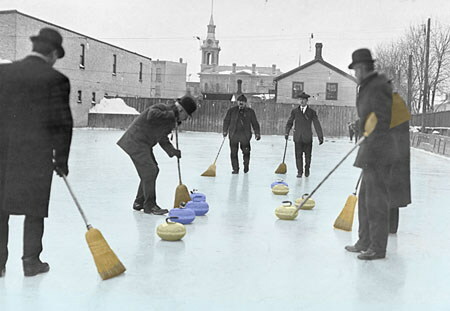 There are 10 "ends" in curling, each one involving throwing rocks down the ice. At the end of each end, there is a bar. At the end of each rink there is a series of circles. The "button" is the bulls' eye, and then they are measured out from there. Non metrically, they are called by their diameter in feet. Each team of 4 takes a turn at throwing rocks/stones alternately (circular 40 lb granite sculptures with a handle on top) at the target at the other end of the rink. The object is to have your rocks as close to the button as possible when both teams finish throwing their 8 rocks (each). You start your throw in the hack, a piece of rubber embedded into the ice, behind the circles. The teams alternate throwing rocks in each end, with the later team called the "hammer". The hammer is determined by who scored least the last end or, in the case of a tie, the hammer carries over. Scoring in the game is determined by the number of rocks you have closest to the button inside the circles. You can score up to 8 if the other team is really bad or Norwegian. Scoring in mixed league is after, at the bar. Did I mention there is a bar? Drinking is not encouraged, it is mandatory. To help keep track of the score, scoreboards more suited to Wrigley Field are at one end of each rink (closest to the bar as it happens). So you throw your rocks and try to set up guards in front, do take outs or steals and end up with the most points at the end of the game. Did I mention the brooms yet or the yelling?. Ok, so if you want to "curl" the stone, you use your brush to "sweep" the path in front of the rock WHILE IT IS MOVING. If you sweep more on one side than the other, the stone will tend to curve in its path - curl - and end up in the spot you hoped it would go. You can, if you are good and you have drank enough, make the stone curl 2 or 3 feet off the line it was thrown on and most of that will happen in the last 15 feet of it's travel. The sweeping is done as you slide down the ice sideways. You can get special shoes for this or just put a piece of wide cello tape on your sole - one only, you need to push a little. But who decides when to sweep? That's the job of the person who has "shot" which happens twice every end. Common phrases are "HURRY" and "HARD" so you'll hear that yelled over the crowd noises. So, ice, rocks, drinking, brooms. It's chess on ice!